Something there was about the World’s Fair of 1893 that seemed to make everyone want to build a house full of secret passages around here. In 1923, Harry Houdini wrote an article in M.U.M., a magician’s magazine, about a conjurer named Zanzic who a operated fantastic spiritualist “studio” in Chicago on north Michigan Avenue during the time of the World’s Fair. According to the story (which he got from one of Zanzic’s assistants), the magician had taken the name of Professor Slater and spent five thousand bucks rigging up an old mansion with trap doors, hidden rooms, sliding panels, and other such trickery. It’s hard not to compare the place to the Holmes “murder castle” on the other side of town. The Holmes building was really designed more for swindling than killing, and so was Zanzic’s new place: everything was carefully rigged up to help him put on the most convincing phony seances in the business. And he was good at what he did – Houdini called him a “charlatan supreme,” with forgers, detectives, and professional magicians in his employ. How long it lasted is not a part of the story, but Houdini describes the place as pretty impressive, using every magic trick known to the trade to make the seances convincing, along with tricks like selling “blindness cures” that were really scoops of gutter mud. As much as Houdini hated fake mediums, he really does seem to have admired Zanzic’s gumption. According to legend, one afternoon while performing on stage a pistol malfunctioned during a “watch me get shot in the face” act, and Zanzic lost one of his eyes – but still did the trick again in the evening show. You really do have to take your hat off to a guy like that. The most famous tale of the Michigan Avenue Mansion almost has to be Zanzic’s piece de resistance. having convinced a wealthy German man that he was making contact with his late wife, the German offered a huge sum if Zanzic could arrange for him to have a conjugal visit with his wife. Ever the daring optimist, Zanzic said he certainly could, and set to work. He found a prostitute who bore enough of a resemblance, set up the seance to cloud his customer’s mind just enough, and put the plan in motion. There was one hitch in the plan, though: while Zanzic and his crew were waiting for the “conjugation” to finish, the woman they’d hired screamed. The German had gotten over-excited at renewing sexual relations with his dead wife, suffered a heart attack, and died mid-coitus. An attempt to dress up the corpse and hide him out in an alley someplace didn’t work out, and the trio had to pay the cops off to stay out of jail. The story is charming as hell, though I can’t for the life of me work out whether the slightest bit of it happens to be true. 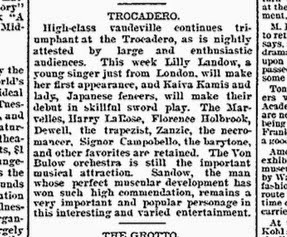 There is an ad in the Chicago Daily Inter Ocean from the time of the fair for “Zanzic the Necromancer” appearing at the Trocedero on State Street (where the Harold Washington Library is now), which at puts Zanzic (or someone using the same name) in Chicago at the right time, but I can’t find anything about the actual address of the mansion, or any vintage advertisements for it, any news of real estate transactions, or even anything in the spiritualist newspapers of the day talking about the terrific seances at Professor Slater’s place in Chicago. If he really spent that much money fixing the place up, you’d think that Zanzic would have made more noise about it. None of this, however, necessarily means that the story isn’t true – it stands to reason that this stuff would be hard to trace. Magicians and charlatans of the day tend to be tough to research – even Houdini wasn’t sure what Zanzic’s real name was, and modern researchers know very little of him. There are conflicting sources on both his life and his death. Frauds and phonies of the day tended to change their names a lot, and there were several who used the same name, further muddying the waters. Also, if you’re going to build a house meant to trick people, you’d probably do so without much of a paper trail, and if someone dies in your place while being tricked into thinking he was doing it with a ghost, well, it’s not like you’re going to put out a press release. Houdini sites Ziska, a well known magician who had been one of the assistants, as a source – Ziska was a real guy, which lends the story a bit more credibility, but made a name for himself as doing magical comedy, and known as a great storyteller, so it’s not unreasonable to assume he may have exaggerated a bit. Unless more info can be turned up, I’ll have to file it among the “Stories so good that I really hope they turn out to be true, even though someone dies in them” files.